As things get older they tend to get bigger. It's the same for people, corporations, models of cars, budget deficits... and so it is for webOS. As Palm was in the process of being subsumed its great mobile operating system was being eyed for much broader things, far bigger than the little phones it had previously been flashed on. Things like printers and desktops and laptops, but for its first proper foray outside of a phone it has a tall task: compete in the brutally vicious tablet space. Its weapon is the TouchPad, a 9.7-inch tablet from HP that got official back in February and will be available July 1st (if you don't manage to find it earlier) -- $499.99 for the 16GB model, $599.99 for 32GB. That's exactly on parity with the WiFi iPad 2 and Galaxy Tab 10.1, current kings of the tablet court. Does this plus-sized Palm progeny really have what it takes to hang at that price point, or is this just a chubby pretender that's outgrown its britches? Read on to find out. 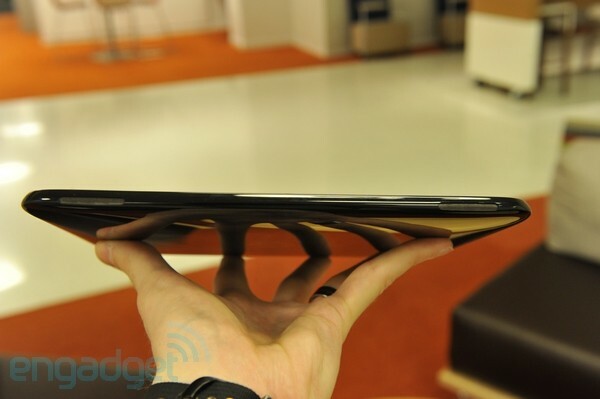 How would you rate the TouchPad? The TouchPad slides out of its cardboard box with a lot of resistance, a precise paper seal creating a vacuum that does its best to keep its tablet firmly ensconced within. Keep pulling and the pressure equalizes, the box yields, and you're granted access to what can only be called a somewhat chunky tablet. It weighs in at 1.65 pounds (750 grams), heavier than the 1.3 pound (600 gram) iPad 2, heavier than the 1.26 pound (570 gram) Galaxy Tab 10.1, and heavier even than the 1.6 pound (730 gram) Motorola Xoom -- which is itself hardly a delicate flower. Its back is black plastic, glossy with a piano-like finish. It's reminiscent of the early, similarly sheen PS3 consoles -- cool to touch and nice to look at, but an astonishingly effective fingerprint magnet. A concave shape makes it comfortable to hold for those of us with bigger hands, more so than the flat profiles of those more slender machines mentioned above, but that comes at the expense of it feeling a bit hollow. The iPad or the Tab give impressions of solidity, of devices with not a hint of room to spare (despite that not necessarily being the case), but the TouchPad feels like there's plenty of space in there for, well, more stuff. That said, the tablet's dark, simple design doesn't make room for many externally defining characteristics, making figuring out which way is "up" a bit of a challenge. But, get it turned the right way 'round and you'll find a petite chrome power button on the right side of the upper edge. A similarly bright volume rocker lies just around the corner, and if you move further down the right edge you'll find a little blanked-out spot that could make room for a SIM in future iterations. Continuing clockwise around, a micro-USB port divides the bottom edge, while on the left two inset speaker grilles lurk beneath holes cut from the side of the case. They do provide comprehensively good audio for a tablet, meaning all that Beats talk Jon Rubenstein gave us wasn't completely PR fluff. That said, the sharp ridges left around these recessed tweeters aren't exactly friendly to the hands. No, the TouchPad won't leave you with bloody palms (which would be delightfully tragic) but literal rough edges like this are surprising on a device that's been in development for this long. Back up top again you'll find the 3.5mm headphone jack on the left side, while a small microphone sits between that and the power button. Around the front is a 9.7-inch, 1,024 x 768 display, matching the iPad and, again like Apple's tablet, that display sits above a small Home button. It's in almost exactly the same place and serves almost exactly the same functionality: push this to pop out of your current app and get back to the system menu, but more about that in a bit. But numbers aren't everything, unless you're a mathematician or an accountant or an astrologist. 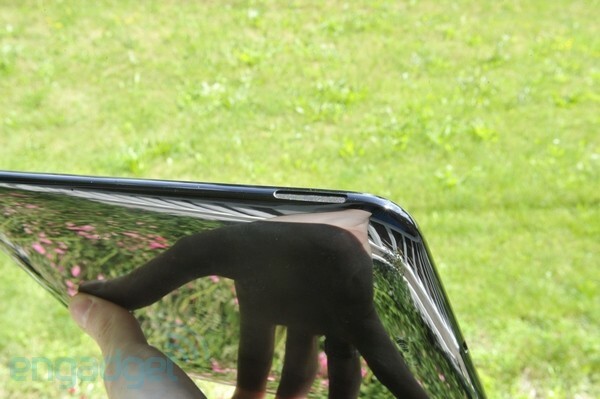 So, how does the TouchPad fare in real life? Browsing is reasonably snappy most of the time, but we encountered some pages that just seemed to take a particularly long time to load. Our site, full of graphics and Flash, loads quickly. The Gmail site, however, takes ages and ages... and ages. Online video plays in the browser, but rarely well. Most apps are quick to load and responsive enough, but some, like Weatherbug, are very slow. It's easy enough to blame the developers getting to grips with new hardware at this point, but ultimately we never felt wowed by the performance. Sure, flipping between tasks is quick and snappy, but changing from landscape to portrait is occasionally sluggish and, after about a day or so, we found we had to give it a reboot to regain optimum performance. We're told that an OTA update is in development that will help to address some performance concerns, specifically with web browsing and orientation adjustments. However, we're not sure exactly when this update will be hitting the airwaves. Battery life according to HP is 9 hours for continuous video playback, and in our test (WiFi on, Bluetooth off, video looping) we came close to that: just over eight and a half hours. 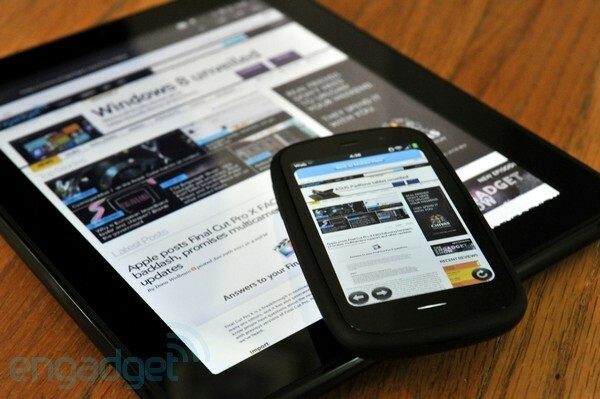 That puts it slightly ahead of the Motorola Xoom but again behind the Tab and iPad 2. Ultimately this means the tablet will comfortably give you a day of serious use, or multiple days of more casual tapping. As we said earlier, it's a 9.7-inch, 1024 x 768 IPS panel up front that matches the iPad 2 pixel-for-pixel and doesn't disappoint when it comes to other important aspects of viewing. Contrast, viewing angles, and brightness all impress, delivering plenty of light for bright or dark rooms and angles wide enough to make sharing with a friend a cinch. The speakers likewise impress -- as you'd hope given the cavernous cut-outs they receive on the side. HP stopped short of slapping a Beats logo on the device but makes no qualms about talking up its branded inclusion in marketing materials. In most ways the speakers deliver, offering (relatively) full sound compared to the tinny mess we're used to. That said, we were surprised to find maximum volume to actually be lower than what the stereo slivers on either side of the Galaxy Tab 10.1 can manage. 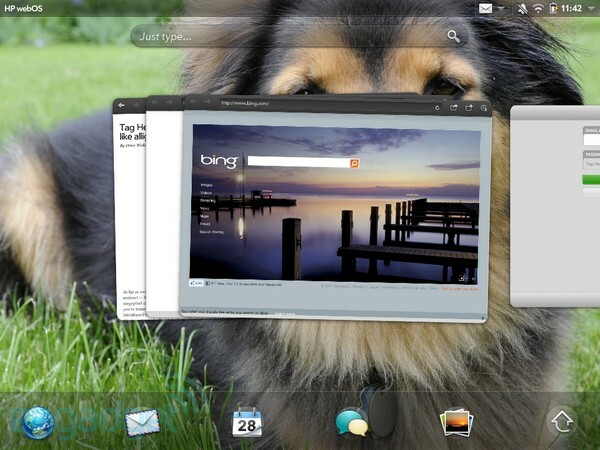 Finally, webOS on the big screen -- or bigger anyway. The TouchPad is HP's first device running webOS 3.0, a more tablet-friendly version of the little mobile operating system that we've come to love over the years. If you're familiar with earlier versions on perhaps a Pre or a Veer you'll be quite comfortable here because, on the outset, not a lot has changed, particularly when it comes to our favorite part of the OS: multitasking. Either tap the physical Home button or just swipe up from the bottom of the screen and you'll get into the patented webOS card view, which has been often imitated but never quite duplicated. Each app gets its own card and, should that program spawn a new window (a new browser instance, say, or a new email) that additional card joins a stack. You can then shuffle through the cards in any given pile, drag them around, or just flick them off the top of the screen to send them to the big garbage collector in the sky. As ever, navigating apps like this is genuinely fun; there's something very satisfying about literally throwing away a window that you no longer want cluttering up your screen or your RAM. And it's all helped by everything in the OS being generally snappy and responsive -- even if the applications themselves are occasionally rather less so. Cycling through running programs and swiping around is quick, but the experience is less gesture-heavy than previous phone versions. In fact, you'll really only be using gestures to switch between tasks. The Gesture Area (the spot on the bezel beneath the display on webOS phones) is no longer there for things like going back and forth in the browser. You'll need to use the buttons in the menu bar at the top of the window for that sort of thing, which is a bit pedestrian and boring. You can still flick up to get the card view, or tap the home button once for that, twice to bring up Launcher. The Just Type feature, where you "just type" to find contacts or documents, hasn't been significantly tweaked, letting you start pecking away at the on-screen keyboard to look up contacts or enter in web URLs. It's a little less instant feeling since you first need to tap on the "Just Type" section of the screen -- unless you pair an optional keyboard -- but it's still handy. Other tweaks include notifications that appear in a top status bar. You'll see an alert should you get a flurry of new emails, and you can quickly flick through them before tapping one to view it in the dedicated app. You can also get quick access to toggling the device's various antennae, and of course get the time and a remaining battery life. There's a screen orientation lock here, but we were wishing for a physical switch as we found the TouchPad to be hugely, well, touchy when it came to flipping from portrait to landscape. Finally, there's the unlock screen, which looks a lot like what you'll find on Android Honeycomb. Just grab the lock and drag it away to get in to the tablet. The screen will give you some information about what notifications are waiting for you behind the screen -- the sender and subject of an email, for example -- but rather curiously there's no way to jump right to those items from the lock screen. The integrated email application is easy and effective, relying on what HP calls Synergy -- a means to tie together multiple accounts and show them all in one view. It'll work with Google, Exchange, Yahoo!, MobileMe, and good 'ol POP3 / SMTP out of the box. We attached our Gmail account and, within a minute or two of watching a spinny indicator do its thing, all our labels appeared as folders and all our emails as, well, emails. 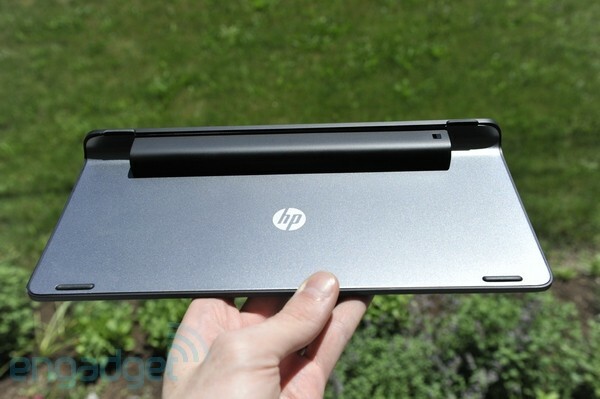 This is probably the best demonstration of the moveable panes UI concept that HP is pushing with the TouchPad. By default, along the left you get a list of folders, in the middle a list of messages within the current folder, and on the right a view of the selected message. But, you can tap below the messages list and drag left to hide the folders, making more room for reading, or tap below the email and drag left to bring that full screen. You can then drag back when you want your lists again. It's intuitive and it works -- except when it doesn't, as we'll see in the Facebook app in just a moment. Ultimately, heavy Gmail users will miss some features available on Android, but this is among the best simple, mobile email clients we've yet sampled. 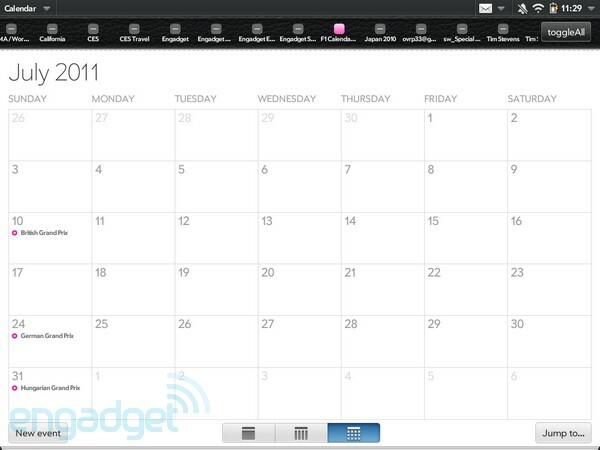 The Calendar app is similarly easy, again pulling in any related Google information should you be using it. Like with email, Synergy lets you sync with many places, including Facebook, Exchange, and Yahoo!, though we found a few selections in the Catalog that bring their own data to the party -- including a Formula One schedule that's particularly handy with all the back-to-back races this season. Ultimately it isn't particularly more or less exciting than, say, Calendar on Honeycomb, but the ability to easily aggregate multiple calendars from disparate sources makes it a useful addition here. At least, for people who have things to do at set times. The loss of the Gesture Area means you won't be swiping to go back and forward here. You'll instead rely on a rather more traditional looking bar full of buttons. 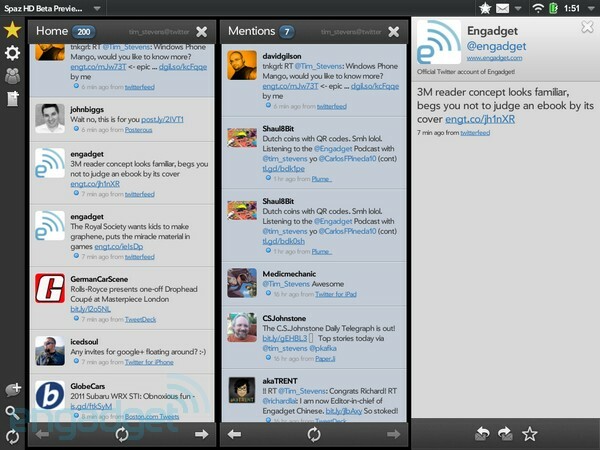 The app will also load the traditional, desktop versions of pages for the most part. There's no tabbed browsing as such, instead you get carded, each new instance added to your stack. You just tap to get to the one you want, or of course flick the ones you don't want off to oblivion. Flash 10.3 is pre-installed and overall browsing performance is reasonably good, but we did notice some odd stops and starts and delays in loading some pages. Full-screen HD video plays, but not particularly smoothly. 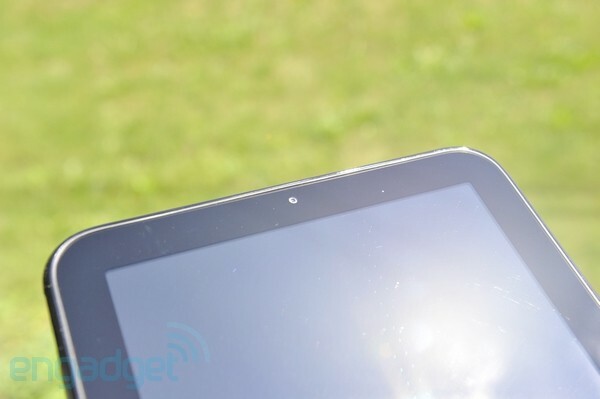 The same videos were far creamier on the Galaxy Tab 10.1. Once loaded, pinching to zoom is quick and responsive, cruising around pages is snappy as can be, and you'll find the familiar "bounce" effect should you try to drag beyond any edge of the screen. In fact, things are very bouncy here. 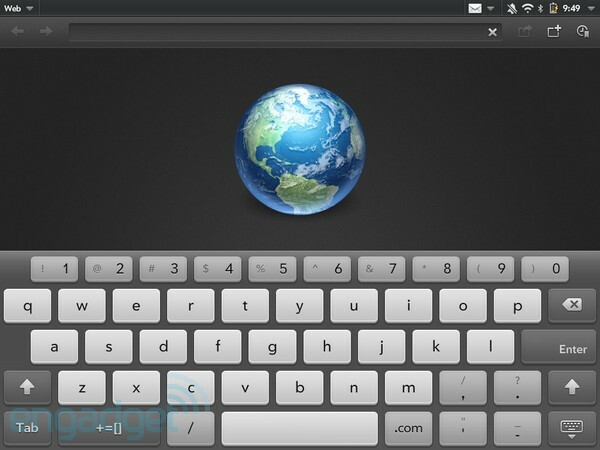 The on-screen virtual keyboard is reasonably roomy, giving you the full QWERTY experience with a full row of number keys in either landscape or portrait. The symbol key gives you access to your usual array of special characters, though many of the more popular ones are available right there on the number keys as well. You're also given buttons for each of six smiley faces, including, tragically, the sad crying face and, rather more excitingly, the OMG face. There's also a <3 button, welcome addition for the particularly lazy typist. The TouchPad is quite good at fixing many spelling mistakes and the like, subtly auto-correcting as you go and alerting you when a fix has been made with a small prompt above the word. That's definitely nice, but we do wish the keyboard would automatically insert apostrophes when typing things like "wont" or "dont." HP did, at least, put the apostrophe key right there on the front so you won't have to go digging for it. The TouchPad gets a custom Facebook app that is better than the Facebook apps on most other mobile platforms because, well, there aren't many that are optimized for tablets -- at least not until that mythical iPad entry launches. 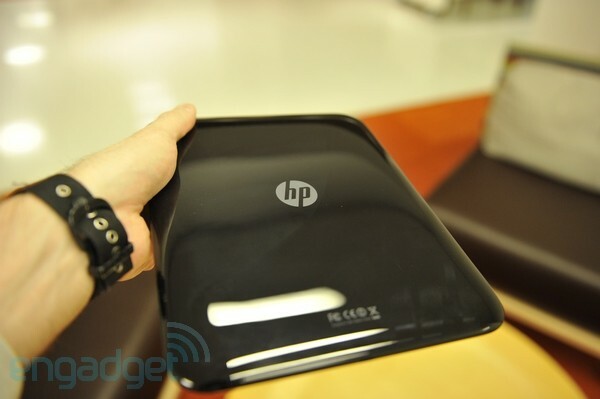 This one certainly is optimized and it looks good -- as it should considering that HP handled the development here. Naturally it's focused on giving you a view into the happenings of those you've chosen to indicate you're friendly with on the service. You're given two perspectives: a traditional list view and a less symmetrical grid arrangement that presents boxes of varying sizes corresponding to the size of the update posted by your associate -- and possibly to the volume of their hubris. 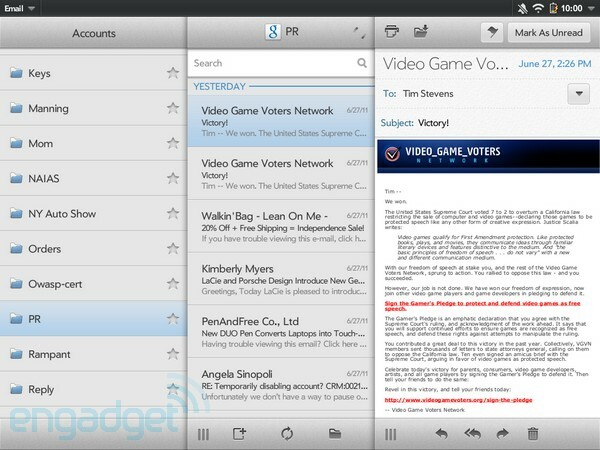 Both rely on the same sort of sliding panes used in the email application, but when you're in list view here the sliding pane inexplicably doesn't fill the screen after being dragged left. It just moves left, leaving a blank spot on the right. Not the end of the world, but something of an obvious bug. The app also lets you quickly browse through your catalog of associates, view all their birthdays in one handy list, and of course peruse your photo collection. 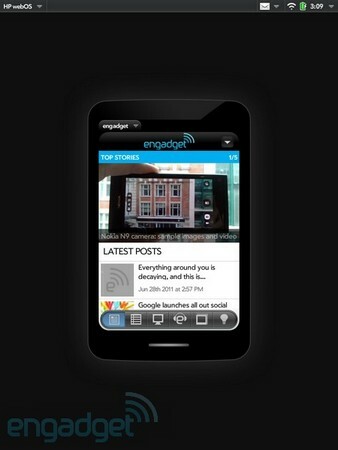 It's a solid addition to the tablet, making social networking easy. 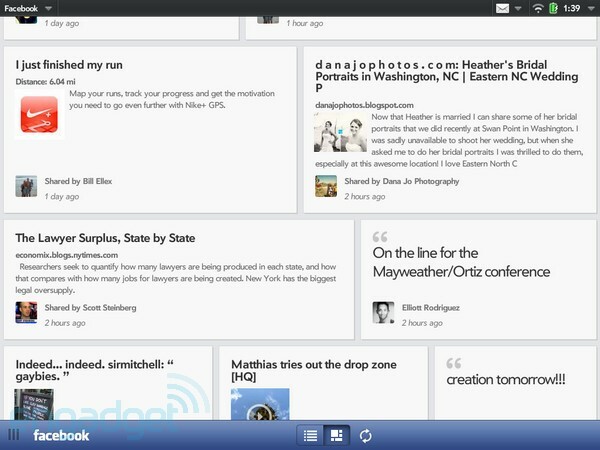 Though you'll get a highly polished Facebook app out of the box, you're left to your own devices if you want to tweet. You can, of course, use the web interface, but serious users will immediately start trawling through the App Catalog to see what's available -- and sadly it's rather slim pickins. We found only one Twitter app that was fully-functional and optimized for the TouchPad, a beta of an app called Spaz HD, and we must say it's reasonably good. It offers a similar multi-column view that's configurable to list your feed, your mentions, a search, direct messages, you get the picture. These columns lack the dragability and resizeability of the other custom apps, but can at least be rearranged, ala TweetDeck. You can save locations, view traffic conditions, and get yourself directions too. We're told the mapping functionality has been exposed to TouchPad devs who want to add a little cartography to their apps, but at this point we're not seeing anybody take Microsoft up on that offer -- including the Weatherbug app, which renders its own maps using Google data and, sadly, offers some of the worst performance we saw on the tablet. As was rumored, the TouchPad is unable to create or edit Office-like documents out of the box. It does ship with QuickOffice pre-installed, but that offers read-only views into your pseudo-productivity files, and even that was a feat it couldn't manage for long. After a few days of use the app inexplicably stopped working. It would just never load. Ever. We're told a fix for that is coming "soon" and that document editing will be available by "mid-summer." 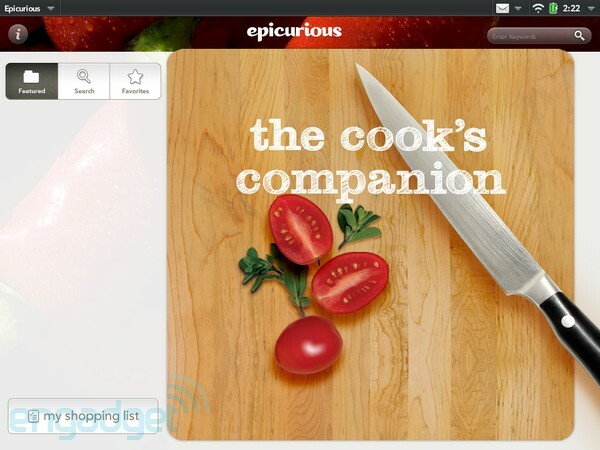 Epicurious brings its culinary delights to the TouchPad with a clean, easy to use app that takes advantage of the surface area here to display recipes, ingredients, and lots of beautiful food photography, ensuring that if you weren't hungry when you tapped the Epicurious icon you will be before you sling it off the top of your screen. You can also create a shopping list if you like directly from any recipe's ingredients, but this tablet's a little too big to be dragging along to the grocery store. Given that the TouchPad is manufactured by a company that earned a lot of its consumer cred by becoming nearly synonymous with the word "printer," it should come as no surprise that the TouchPad supports printing out of the box -- assuming you own a compatible printer. But, it should, perhaps, also come as no surprise that the number of printers that are supported is somewhat limited. Any HP-branded network-connected PCL-capable ink jet or laser machine can be connected and printed to by the tablet. This covers the vast majority of HP printers sold over the past five years, but if yours is a little older or, perhaps, a little more generic, you might need to start looking for alternatives. Skype support is built in to the TouchPad and webOS 3.0, which is good, because otherwise you'd have nothing at all to do with that 1.3 megapixel camera up front. All the contacts on the device are Synergy'd together, which makes for a bit of a mess if you just want to Skype somebody. 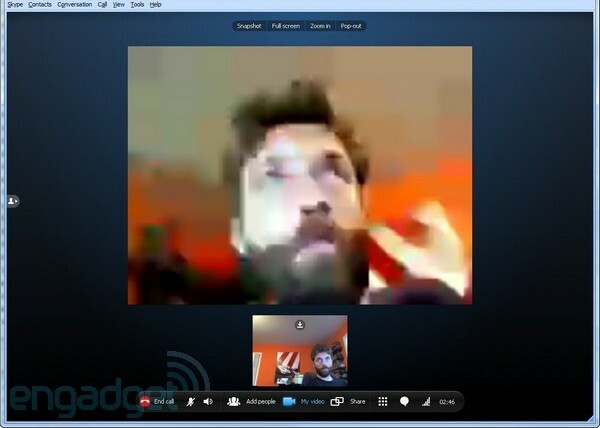 Also a bit of a mess: what you'll look like to whoever you call. We tried multiple video chats and, while the video going down to the tablet looked okay, that going out looked generally awful despite sitting on a solid 802.11n connection. Just rolled out of bed? No worries, you're good. The selection in the App Catalog is quite good, but the subset of apps actually optimized to take advantage of the full display here is quite slim. HP pledges to have 300 TouchPad-optimized apps available in the Catalog in time for the launch, and a further 6,200 from phones. Those apps will be mostly unable to make use of the resolution, running in a small picture of a phone, which is a little quaint but also disappointing, especially since you can't even rotate that faux phone from landscape to portrait. Those few apps that have been optimized are good, and the curated Pivot magazine definitely highlights some of the better ones, but ultimately we didn't really find anything here that made us want to hang up our iPad and shut down our Galaxy Tab. That HP-developed Facebook app is really the only piece of software that's genuinely better than what's available elsewhere, and we think we could make do without it. It's perhaps a little early to get too excited about what the TouchPad can do with the Pre 3, given that it'll be awhile before release. But, should you find yourself in possession of one of HP's next portrait QWERTY sliders rest assured that it'll happily talk to your TouchPad. The two pair over Bluetooth quickly and, once suitably synched, can exchange contact and messaging information. Getting a call on your phone? You can pick it up on your tablet and use it like a gigantic Blueooth headset. Want to send an SMS? Don't squint at the little, rubbery keyboard tucked within the Pre 3, tap away at the expansive, glossy one in the TouchPad. But, of course, the biggest news here is Touch to Share, which allows you to open a webpage on your phone, tap that phone against your tablet, and have the tablet bring up that page. You can also send URLs the other way or, indeed, swap by just having the browser open on either end. In this way there's obviously not a lot of smarts behind this functionality -- either device just pushes addresses when proximity is detected -- but there's a fair amount of elegance to the process of exchanging information here. We've often downplayed the importance of high-quality rearward-facing cameras on tablets because, well, holding up a big slab of a gadget to take a picture of something is far from easy and equally distant from anything rewarding. That said, we certainly don't hate the things and having one is a standard feature on modern tablets -- and so we're a bit perplexed by the complete omission of a rear-facing camera here. You do get an 1.3 megapixel front-facing shooter, which at this point can only be used within the integrated video chat application -- Skype. Because of this we're unable to give any accurate description of the capabilities of said sensor, simply because we couldn't capture the output from it. The Pre wowed us with its inductive charging built-in, and the TouchPad continues that tradition with its Touchstone Charging Dock, which too features wireless charging and sets the tablet into Exhibition Mode. In the settings you can tell it to display a fancy looking clock, your current agenda, or cycle through photos and videos. Other apps will be available down the road that you can select as well. 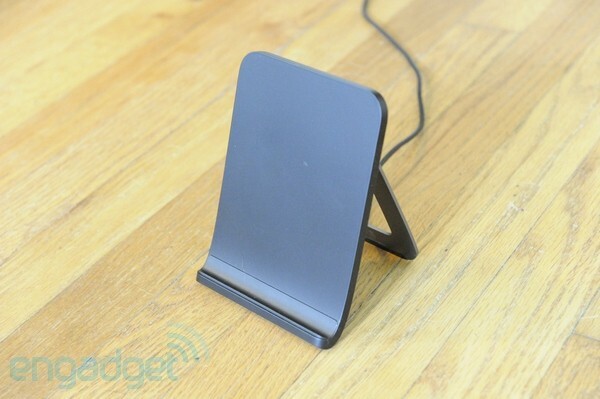 The dock itself is of a simple construction, with a swivel-out stand that lets you situate the tablet at just about any angle you like, and rubberized feet to keep it from slipping flat. At $80 it's a lot for a glorified dock, though the original Touchstone wasn't exactly good value when it launched for $50. For one to embrace the true post-PC world one must, naturally, give up one's PC. That means the PC's keyboard too, and if writing every last email on a touchscreen doesn't sound particularly utopian you'll want a keyboard. 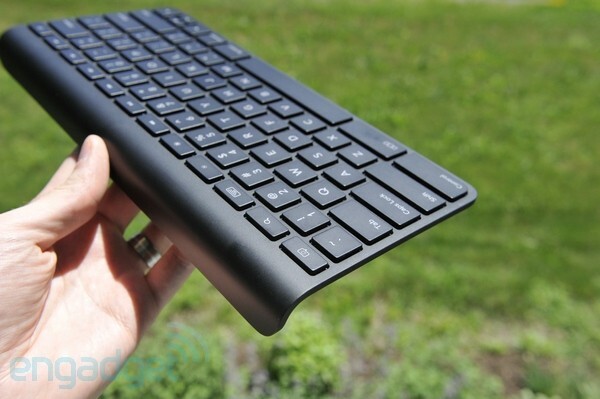 HP would like you to use this one, a $70 wireless unit that connects quickly and easily over Bluetooth and gives you access to a full QWERTY layout plus a number of special keys. Each key is flat, well-spaced, and the feel is almost exactly the same as Apple's wireless keyboard. In fact, almost everything is exactly the same as Apple's unit, which isn't a bad thing. You can turn the tablet's screen on and off with a dedicated power button, switch between apps, adjust the screen brightness, and, most importantly, Just Type by just typing. If you're a heavy tablet user it's very, very nice to have, a light and slim design makes it easy to pack, but a $70 price tag makes for an expensive accessory. Oh, happy day, when one first receives a device that's been eagerly anticipated for months. Sad, sad day when that device fails to live up to one's expectations. We all wanted the TouchPad to really compete, to give us a compelling third party to join the iOS and Android boxes on the ballot. But, alas, this isn't quite it.